In the United States, consuming alcohol under the age of 21 is considered underage drinking and is strictly against the law. Drinking underage comes with legal consequences including mandatory community service, suspended license, fines and potential time in jail. Not only do individuals put themselves in danger, but they also put others in jeopardy if they get behind the wheel of a car or become violent. Many adolescents consume most of their alcohol by binge drinking. This means they consume an excessive amount of alcohol in a short period of time. Binge drinking for males involves having five or more drinks in a two-hour period, and four or more drinks for females in the same timeframe. It is extremely risky behavior that can lead to a host of problems, including alcohol poisoning. Frequent excessive drinking will begin to take a toll on a person’s personal life, relationships, school work and possibly professional goals down the road. If you or someone you know is fighting against a drinking problem, it’s time to seek help and take back control of your life. Our treatment specialists can help you find top-rated treatment facilities, local support groups and other effective alcohol recovery resources. Call us now to get started on your road to recovery. Family members, teachers, friends and other loved ones are usually the first people to recognize the warning signs of underage drinking. While some symptoms are easy to identify, others may not be as apparent. Warning signs, no matter how minor they may seem, should be taken seriously and treated immediately. Waiting for a drinking problem to simply fix itself can only worsen the situation and trigger more harmful effects. Adolescents who drink tend to have sudden changes in their behavior and may begin to perform poorly in school. Mood changes often involve irritability, aggressiveness, anger and defensiveness. You may even notice dramatic changes in behavior – one minute they’re happy and the next, they’re upset. Additionally, drinking can cause academic issues. Sometimes students may skip school, disrupt class, not complete homework and receive failing grades. These are all signs of a potential problem and should be addressed immediately. During the middle and high school years, many adolescents participate in extracurricular activities and have various hobbies. 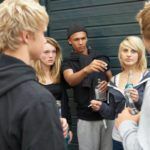 However, young people who have developed an alcohol problem are less likely to care about the sports, performances or other activities they may be involved in. Suddenly, their attention shifts and they no longer care about the things that once made them happy. This is because they’re focused on getting and drinking alcohol to satisfy a craving or urge. A common side effect of heavy drinking is memory loss. Having difficulty remembering things doesn’t just occur in long-standing alcoholics. In fact, alcohol can significantly impact an adolescent’s memory because their brain is still developing. Another problem triggered by drinking is a lack of concentration. When someone is under the influence, they are usually easily distracted and are unable to focus on a single task for too long. This may become apparent when they’re doing school work or chores around the house. Alcohol has a very potent scent and is strong enough to be detected on an adolescent’s breath, or as it seeps through the pores of their skin. To avoid confrontation with their parents or other loved ones, children may try to cover up the smell with mints or body spray. Other noticeable symptoms of drunkenness include slurred speech, coordination difficulties, bloodshot eyes and flushed face. These are red flags to watch out for when dealing with underage drinking. Another sign of alcohol use is when an adolescent’s group of friends changes dramatically. It’s common for underage drinkers to hang around peers that encourage or push them to consume alcohol. Information about these new friends is often limited and they generally keep a distance from family members. An adolescent may be very general when talking about hanging out with their new group of friends such as where they’re going, who will be there and when they’ll be back home. By age 15, roughly 33 percent of adolescents have had at least one drink. By age 18, that number increases to an estimated 60 percent. Every year, there are more than 4,000 alcohol-related deaths in individuals under the age of 21. This includes car accidents, homicides, alcohol poisoning and suicides. Adolescents who start drinking before the age of 15 are four times more likely to become alcohol dependent at some point in their lives. Underage drinking can contribute to many short- and long-term side effects. Unfortunately, adolescents often do not think about the consequences associated with their drinking patterns until it’s too late. Some of these effects can even stay dormant for years before surfacing. Additional effects of alcohol use can develop as an adolescent gets older. For example, long-term alcohol consumption can lead to cardiovascular diseases, liver disease, cancer, nerve damage and respiratory infections. Some of these conditions are often irreversible and can worsen a person’s health over time. The only way to prevent the health risks associated with alcohol is to quit drinking entirely. Every day, month and year that goes by alcohol-free reduces the chance of dangerous complications. Learn about the effective treatment resources available and alcohol rehab facilities that fit your needs by calling us today. Although you cannot force an adolescent to stay away from experimenting with alcohol, there are several ways to help prevent underage drinking. First and foremost, you should talk to the child about the dangers of drinking. Have an open dialogue about peer pressure, the negative effects of alcohol, and the physical and emotional troubles caused by drinking. Kids should also have a chance to discuss how they feel, as well as ask any questions they may have. It’s important for adolescents to feel at ease when talking with a family member or loved one. This builds trust which serves as the foundation of a strong relationship. Another way to keep a child from drinking is to encourage hobbies and activities. Find out their interests – athletics, acting, musical instruments or volunteering – and let them try some out. After-school activities give kids an opportunity to meet new peers, stay busy and have fun doing something they enjoy. This is also a great opportunity for parents or other loved ones to become involved in the adolescent’s life and show support. If you know an adolescent who is showing the signs of a drinking problem, you should seek help sooner rather than later. We can develop a tailored recovery plan that fits your loved one’s needs. Speak with a treatment specialist today to learn more about adolescent treatment options nearby.